If you like pizza, you’re sure to love focaccia and it’s easy to make. Focaccia is like a pizza without the sauce or cheese, but wait a minute, don’t fault it for that, it has it’s own virtues. When you have a pizza, that’s what you have, but with focaccia, you can make a sandwich, or a faux pizza, or even make croutons for salad or a soup. Here’s a way to make a focaccia that can make four sandwiches, or you can use it as dinner bread. Mix all together. Stir in enough warm water (about ½ cup) to make a soft dough. Knead the dough on a floured board for about 5 minutes. I do this in a small food processor for one minute. Put a little oil in a bowl, put the dough ball in, coat it with the oil and let rise one hour. Put dough back on the board, flatten it and shape it to fit a greased 8”x8” or 9”x9” baking dish. Poke the surface all over with the tip of the handle of a wooden spoon to make small holes all over. Brush olive oil on the top surface and sprinkle some course salt on it. You may put some diced onion or minced garlic cloves, olive slices or shredded Parmesan cheese on the top. A couple tablespoons fresh coarsely chopped rosemary is very popular. If you have a baking stone you can remove the shaped dough and place directly on the stone, using a big spatula coated with a little corn meal or else bake it in the pan. Bake the focaccia for about 10 minutes, till the crust is brown. I use a baking stone placed on the top shelf, and when the oven temperature is reached, I put the focaccia on the stone, shut the oven off and turn on the broiler. So that the broiler element stays on I keep the oven door ajar. It doesn’t take the entire 10 minutes under the broiler, so check it halfway if you try this. I like the way you get a charred effect baking the focaccia this way. You can quarter the focaccia, and then horizontally slice each quarter to make four sandwiches. Or cut each sliced quarter into strips and serve with a small bowl of herbal infused olive oil for dipping to accompany meals. Focaccia is good to a fault. Enjoy. 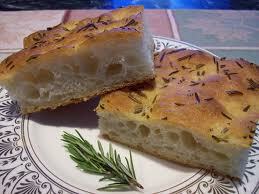 I LOVE Italian breads dipped in olive oil, so this focaccia sounds fabulous! Great idea for a meal! So delicious! And I like the alliterative title. A neat F. Thanks for sharing the recipe. I've never made it but when I go to the heath food store I alway coose focaccia for sandwiches. yummm it makes the mouth water when you think of it for dipping. This sounds really good. I have never tried it. What a great idea for a post..a recipe.